Today we’d like to introduce you to Patti Swanson. Patti, please share your story with us. How did you get to where you are today? I started Chicago for Chicagoans in June 2016. Bored by my day job and wanting to get back into giving tours — something I’d done & enjoyed for years– I spontaneously planned a little walking tour of my home neighborhood (Albany Park). Over 100 people ended up RSVP-ing for the event on Facebook, and I was totally blown away by the positive response! I ended up scheduling three more Albany Park tours, and carried the momentum into a more formal, sustainable project. Since then, we’ve done over 40 tours in 11 neighborhoods. I create, organize, research, and promote a new tour about every month, and I work with a local neighborhood expert in each neighborhood to bring authenticity to the project. We’ve also been proudly pay-what-you-can since day one. Running a small business or startup is never a smooth road, although I’m fortunate to have an amazing support system, passionate and committed collaborators, and a mind-bogglingly enthusiastic following that has made most bumps easy to overcome. That being said, part of the continuing struggle I face is a lack of work/life balance — I work full time in addition to managing this project and it’s often exhausting! I’m getting better at not working when I’m relaxing or out with friends, but it’s definitely a struggle to get it all done and also maintain my sanity. Chicago for Chicagoans – what should we know? What do you guys do best? What sets you apart from the competition? 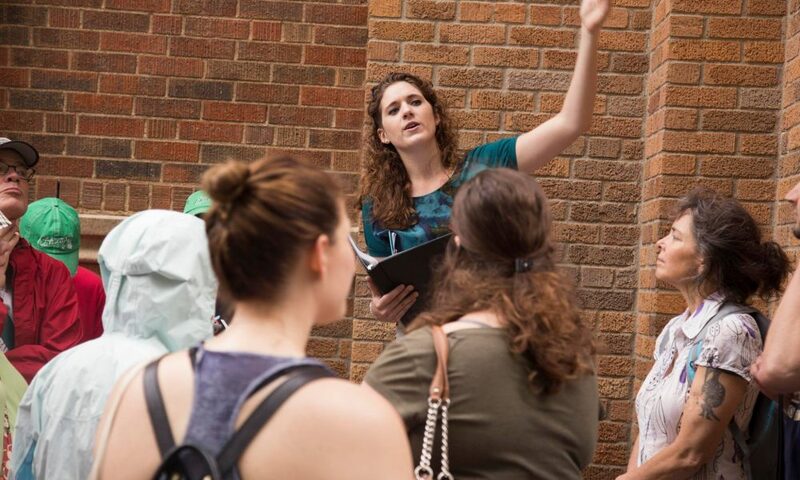 Chicago for Chicagoans specializes in neighborhood tours given for and by Chicago residents. We’re different in that we’re a community-created, pay-what-you-can project that runs a bit like a pop-up. We do a different neighborhood each month, and although we repeat tours from time to time, it’s kinda like, “if you miss it, you miss it.” I think the thing I’m most proud of is also the most controversial aspect– my collaborators and I don’t shy away from being political, pointing out inequality and injustice, and calling for change. I strive for inclusivity, and to create tours that everyone can feel welcome on. I try to cover every side of every story, and provide representation for the often-ignored histories of minorities– including the stories of queer folks, immigrants, and the poor and working classes. And that’s something that I’ll never be “done” with. You’ve never hit the pinnacle of inclusivity. Right now I’m working on getting more South Side tours on the books and maybe figuring out how to offer tours in Spanish, or other languages. The pay-what-you-can nature of the tours is another aspect of that desire to be inclusive. I want everyone to be able to afford to learn about their community history in a fun way. I don’t think many other tour organizations are that vigilant about inclusion. I honestly define success by seeing repeat tour-takers! I love when people come back each month for the newest tour, and seeing them jump on registering for the events as soon as they’re posted. And I love when they show up in terrible weather, stay even when the tour runs long, and bring friends along. It confirms to me that I’m doing something people enjoy, and that I’m doing it well. That’s everything– getting people to enjoy learning about their city, and consistently exploring new parts of it. I want to incorporate as a non-profit someday, so the money doesn’t matter too much for me. Of course, it’s nice when people tip you generously even when they don’t have to. But that’s just the cherry on top.